Turkish company Cengiz Enerji Sanayi ve Ticaret A.S. will build a new combined-cycle thermal power plant with a capacity of 240 megawatts in Uzbekistan's Bukhara region, Trend reports via Uzbek media. The project is based on the agreement signed on March 20 in Tashkent by the Minister of Energy of Uzbekistan Alisher Sultanov and Chairman of the Board of Cengiz Holding Mehmet Cengiz. "The project will be implemented on a public-private partnership. The Kogon district of the Bukhara region near the Kuyimazar reservoir is chosen to be the construction site of the power plant. 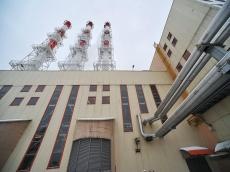 Thermal power plant operating on natural gas includes two gas turbines manufactured by General Electric (US) and one steam turbine manufactured by Siemens (Germany)," a source at Uzbek Energy Ministry said. The construction of the 240-megawatt power plant in Bukhara will allow covering the region’s need for electricity and reducing losses in the course of power transmission through the main transmission lines. On March 20, the Ministry of Energy of Uzbekistan and the Turkish company Yildirim Enerji Holding also signed an agreement on the construction of a combined cycle thermal power plant in the Surkhandarya region with a capacity of 900 megawatts.